A courtroom drama centred on the Holocaust, Denial explores the difficulty of debunking ridiculous conspiracy theorists. It's 1994, and in Atlanta, Georgia, American professor of Holocaust studies Deborah Lipstadt (Rachel Weisz) writes a book condemning the lies of Holocaust denier David Irving (Timothy Spall), a British historian specializing in Nazi Germany, and a fan of Adolf Hitler. In London, Irving files a libel lawsuit against Lipstadt. To mount a defence she turns to celebrated lawyer Anthony Julius (Andrew Scott), who represented Princess Diana, and his partner Richard Rampton (Tom Wilkinson). As part of their case preparations Deborah and Richard visit the remains of the Auschwitz concentration camp and meet with Holocaust researchers. Julius and Rampton clash with Deborah on whether she should testify or not, and on whether Holocaust survivors should be called as witnesses. In 2000 the libel case finally makes its way to court, creating a media circus, with Irving representing himself. Based on a true story as published in Lipstadt's book and directed by Mick Jackson, Denial is a relatively low-key affair, despite tackling one of history's worst atrocities. Due to England's rather eccentric libel laws, the onus is on the defendant to prove their statements as factual, resulting in the bizarre necessity for Lipstadt and her team to justify calling Irving a liar because, well, the Holocaust indeed did happen. Towards this quest the film achieves and sustains a modest level of engagement, but never rises to any heights. A couple of problems hold Denial back. The first is the mismatch in resources and talent invested in each side of the legal battle. Jackson is only interested in Lipstadt and her well-resourced team containing some of the top legal minds in Britain. 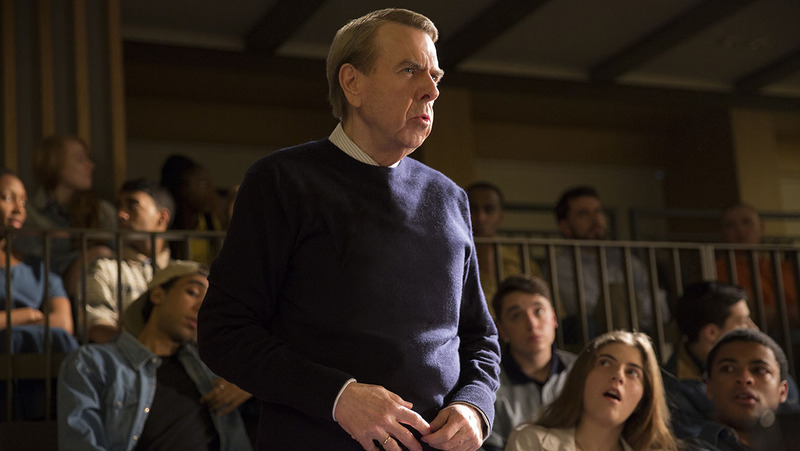 On the opposite side of the aisle Irving is a frumpy, lonely presence with no support, and the film never delves into his thinking or preparations, essentially defanging the antagonist. Resources do not necessarily equate to success, but a heavyweight with a full entourage will rarely lose to an untrained lightweight. Another obstacle for the film is the central character silenced in her own story. Most of the tension is derived from Lipstadt disagreeing with her legal team's lean and scholarly strategy to keep the focus on Irving's lies. The lawyers prevent her from testifying and resist her advocacy for Holocaust survivors to appear as witnesses. 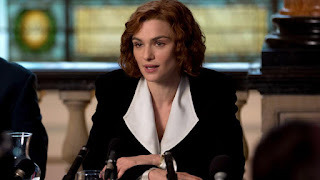 Begrudgingly Lipstadt has the good sense to recognize that she is a professor and her lawyers are the courtroom experts, but this also means that for most of the second half of the film Denial is about grey lawyers doing their thing. Wilkinson as the barrister Rampton shines in these scenes, but he is always a secondary character in the story. Nevertheless, there is still plenty to admire. Jackson delivers a taut 110 minutes of drama, keeping the focus on the case across seven years from 1994 to 2000. The scenes at Auschwitz are suitably affecting. 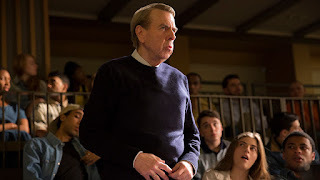 Weisz and Spall join Wilkinson in delivering sturdy performances, and the film manages to throw in a minor source of uncertainty near the climax, raising the question of whether a man who believes his own lies is actually lying or not. Denial is a worthwhile story told with genuine heart, but a case of proving a buffoon is a buffoon can only carry so much weight.